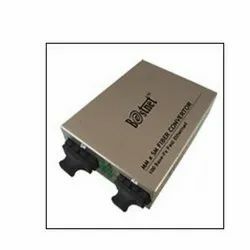 We are a leading Wholesaler of fiber media convertors, media convertor bn-10/100e, media convertor bn-10/100es, media convertor bn-10/100/1000e, media convertor bn-s/m 100m and media convertor bn-s/m 1000m from Bengaluru, India. We Are Providing All Types Of Fiber Media Convertors & Switches In Different Ranges. BN-10/100E Fiber Media Converter is 10/100Mbps fast Ethernet converter. The converter mediates between a 10/100Base-Tx segment and a 100Base-FX segment. It is primarily designed for large, higher speed/bandwidth demanding workgroups that require expansion of the Ethernet network. It can extend the conventional 10Mbps Ethernet or 100Mbps Fast Ethernet to 2kms via the fast Ethernet Fiber-optical line. It is high-performance, cost effective and flexible solutions for a wide range of applications in the field of LAN campus network. High performance and auto sensing exchange chip, which have full functionality of transferring and exchange, guarantee the safety and stability of data transfer. BN-10/100E Fiber Media Converter is 10/100Mbps fast Ethernet converter. The converter mediates between a 10/100Base-Tx segment and a 100Base-FX segment. It is primarily designed for large, higher speed/bandwidth demanding workgroups that require expansion of the Ethernet network. It can extend the conventional 10Mbps Ethernet or 100Mbps Fast Ethernet to 20 kms via the fast Ethernet Fiber-optical line. It is high-performance, cost effective and flexible solutions for a wide range of applications in the field of LAN campus network. Led Indicators TX LINK, FX LINK, TX ACT, FX ACT, PWR, FDX. BN-10/100/1000E Fiber Media Converter is 10/100/1000Mbps fast Ethernet converter. The converter mediates between a 10/100/1000Base-Tx segment and a 1000Base-FX segment. It is primarily designed for large, higher speed/bandwidth demanding workgroups that require expansion of the Ethernet network. It can extend the conventional 10Mbps Ethernet or 1000Mbps Fast Ethernet to 550 Meters via the fast Ethernet Fiber-optical line. It is high-performance, cost effective and flexible solutions for a wide range of applications in the field of LAN campus network. Single mode multimode converters are simple and stable equipment to connect multimode fiber traffic to single mode fiber devices and links.100 base single mode to multimode bi-directional converters could be used individually to connect 100Base-FX multimode devices to accordingly single mode devices, or in pairs at each end of long-distance single mode fiber links.These Converters offer perfect solution dispersed networks where media conversion required between multimode segments separated by long distances. This is a stand-alone 100Base-FX multimode to single mode converter. Single mode multimode converters are simple and stable equipment to connect multimode fiber traffic to single mode fiber devices and links.1000 base single mode to multimode bi-directional converters could be used individually to connect 1000Base-FX multimode devices to accordingly single mode devices, or in pairs at each end of long-distance single mode fiber links.These Converters offer perfect solution dispersed networks where media conversion required between multimode segments separated by long distances.